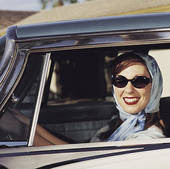 If you want the authentic old-fashion housewife look, especially for running errands, a simple scarf wrapped around your head and a pair of Bolle sunglasses should do the trick. Step out in style while looking simple and chic at the same time, not to mention making the other housewives jealous while grocery shopping. No matter what the whether is like, this is a geat all around classy look.